Click the Menu Item Type Select button and then click the List All News Feed Categories link under Newsfeeds. To edit an existing Newsfeed Categories Item, click its Title in Menu Manager: Menu Items. Used to show a list of all News Feed Categories. Select a Top Level Category. Shows a dropdown allowing the selection of any newsfeed category. 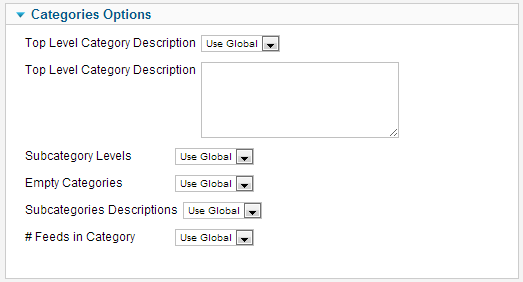 The Categories Options control the way that parent and subcategories information is shown in the layout. 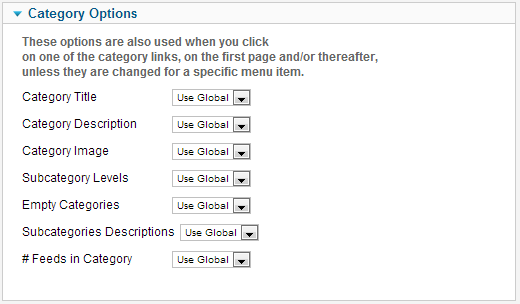 The Categories Layout has the following Categories Options, as shown below. Top Level Category Description. Choose the text for the parent category description. Note this depends on the Show/Hide parameter above. # Feeds in Category. (Use Global/Hide/Show) Whether to hide or show the count of feeds in the category. # Articles in Feed. (Use Global/Hide/Show) Whether to hide or show the count of articles in each feed. Feed Links. (Use Global/Hide/Show) Whether to hide or show the feed links url. The Category Layout has the following Newsfeed Options, as shown below. These options determine how the newsfeeds will show in the list layout. 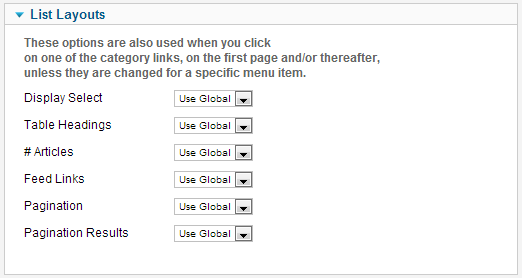 Use Global: Use the default value from Newsfeed Manager Options. Feed Image. (Use Global/Hide/Show) Show or hide images in the feed. Feed Description. (Use Global/Hide/Show) Show or Hide the Feed Description. Feed Content. (Use Global/Hide/Show) Show or Hide the Feed Content. Character Count. (Integer) The number of characters to display for the feed. The Categories Newfeed is a convenient way to allow people to see newsfeeds from a range of different categories on your website. To create a new Category see News Feed Categories Manager: Add or Edit. This page was last modified on 14 April 2013, at 19:53.